I’ve watched sales professionals expend an enormous amount of energy making sure all these aspects align so they achieve the success and income that they desire and deserve. This requires that salespeople perfect the techniques that get you in front of your potential customer, make you likable and above all, persuasive. SELL YOURSELF My one universal concept that never varies or waivers no matter if your sales business is B2C, B2B, retail, real estate, insurance, technology, securities or manufactured goods: selling is not about selling your product or service, it’s about selling yourself. That doesn’t mean that you don’t need product knowledge or that you don’t need to create value to influence the close. But consider this: having an A+ product with A+ product knowledge means nothing if you can’t even advance to the presentation. First and foremost, you have to think of yourself as your product. What attracts consumers to a product? The packaging, its features, its price, its guarantees. Manufacturers design and market their goods with consumer appeal uppermost in their mind. As a sales person, you have to market yourself in the same manner. You are the manufacturer of your product: which is you. Dress for success, channel confidence and charisma from within, and attract your buyer to you. You have to make an impression. Be unique. Be distinctive. Be remembered or be forgotten. At trade shows, I’m known as The Suit. Even if the dress code is business casual, I show up in a suit because that’s how I want to be remembered: the guy who always looks professional and is ready to deal with the CEO or the doorman. You know the saying: “You only get one chance to make a first impression.” What first impression are you giving your prospects? MAKE YOUR PROSPECT COMFORTABLE Frankly, make them like you. There’s a fine line between confidence and arrogance, persistence and annoyance, being knowledgeable and being a knowit-all. You have to know where and when to draw that line. You have to make your customer want to engage with you and do business with you. Even with today’s online researching and buying trends they will not buy from you if they do not like you and trust you. 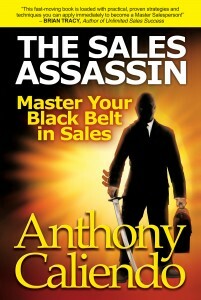 MASTER "THE ART OF ASKING QUESTIONS WITHOUT ASKING" You must make a connection with your buyer. Learn how to get them off the defense and extract as much information as possible so you can assess their needs – without them even realizing it. The best advice I can give new salespeople is to learn how to open up the dialogue and then learn how to listen. Listening is a skill: not everyone is born with the ability to listen. But if you want to learn how to improve your sales skills, learn and practice your listening skills. Next thing you know you’ve gathered all the info you need for your closing arsenal. Now close. Remember: LISTEN and SILENT are spelled with the same letters. Think about it. ISOLATE YOUR BUYER'S HOT SPOTS Create value, create need and create solutions for your potential buyer. In today’s buying cycle the vast majority of buyers have done their online research before they ever speak to a salesperson. They asked for recommendations, they’ve Googled your company and you, and they have decided that they want to hear your pitch. Don’t waste their time: hone in on what is actually important to them and then be prepared to give them the solutions they are looking for, not the pitch you’ve been preparing for months. That’s not to say you shouldn’t have your big pitch ready: a Sales Assassin is always prepared to change course to meet the buyer’s needs. They know their problem: but you have the solution. A buyer may be very clear that he needs to purchase ABC, but when you hear the problem a good salesperson is prepared to explain why XYZ is the real solution to their need. Don’t confuse this with upselling: cross-selling is solving problems the client may not even realize he has, or known that you could solve. Refer to #3: LISTEN. RECOGNIZE EMOTIONAL DRIVERS AND NEGOTIATE ACCORDINGLY Don’t be so preoccupied with your own goal to reach the finish line that you fail to identify your potential buyer’s signals. You are pitching a product to your prospect to solve their problem – not to solve yours. So when your prospect is giving you clues as to what they may be thinking or feeling, you need to recognize that this is what drives them to make their final buying decisions. In reality, we all know salespeople do have to solve their problems: meeting quota, a family to support, a sales manager watching their every move. But that’s your problem: not your client’s. Once you make your problems the client’s, you’re sure to lose the relationship and the sale. So tune in and negotiate accordingly. Once you’ve solved the client’s problem, you’re their hero – and you’re their go-to sales rep.